Connectivity is making cybersecurity a must-have obligation from initial designs through end of life. Automakers and suppliers have several unique challenges as they attempt to provide connectivity in vehicles that have burgeoning amounts of software that must remain secure and efficient over long vehicle lifetimes. Throughout the industry, there is a race to leverage safeguards used in other industries in ways that meet automotive safety and reliability requirements. 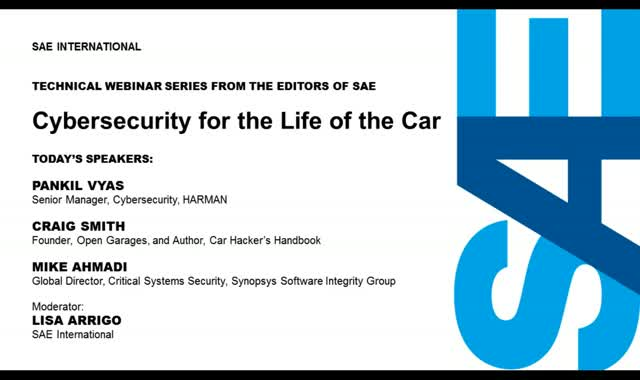 During this one-hour webinar, industry experts will address design, development, and implementation of security-critical cyber-physical vehicle systems; implementation strategies, process, and lifecycle management; and cybersecurity assurance verification and validation practices being implemented by members of SAE working groups. A number of tools will be employed, many using over the air (OTA) updating to fix vulnerabilities and adapt to changing threats. An audience Q&A will follow the technical presentations. Vulnerabilities are an inevitable part of software development and management. Whether it’s open source or custom code, new vulnerabilities will be discovered as a code base ages. A 2017 Black Duck analysis of code audits conducted on 1,071 applications found that 97% contained open source, but 67% of the applications had open source vulnerabilities, half of which were categorized as severe. As the number of disclosures, patches, and updates grows, security professionals must decide which items are critical and must be addressed immediately and which items can be deferred. IT operations teams are now deploying and running hundreds or even thousands of containers at any given time. This rapid deployment surfaces challenges in validating the contents and security of container images being deployed. In this session, Black Duck container and virtualization expert Tim Mackey will provide an overview of technologies and solutions such as Red Hat OpenShift that enable organizations to deploy containers at scale securely. In this webinar, Tim Mackey explores this new era of large scale container deployments and how to manage and secure them. DevOps teams are using cloud platforms and containers to build, deploy, and manage applications faster than ever, and utilizing large amounts of open-source software to increase agility. Google Cloud platform makes building and shipping containers even easier with Google Container Builder, Google Container Engine (GKE), and Google Container Registry (GCR). But when you deploy a container or cloud-native application, it’s hard to know exactly what contents are inside, and that can make managing security painful. - The Grafeas and Kritis projects, and the work Google and Black Duck are doing to enhance security visibility and provide policy enforcement for containers. The Equifax breach provided a unique look into “how” many breaches occur. In Equifax’s case, hackers exploited an unpatched Apache Struts component, resulting in the exposure of over 140 million consumer records. The exploit of this vulnerability highlights the need for visibility to open source in custom applications and just how ineffective traditional security solutions are when it comes to open source vulnerabilities. Further, while class action lawsuits have already begun, Equifax faces other regulatory challenges as well. The US Federal Trade Commission started investigations into the company’s security policies and controls that will likely result in financial penalties. Since the exposed data included non-US citizens, foreign data protection and data privacy regulations also come into play. Join Mike Pittenger and Bob Canaway as they discuss how organizations can more effectively manage open source, the strengths and weaknesses of testing methodologies in identifying vulnerable open source components, and how data privacy standards such as PCI, Section 5 of the FTC Act, and GDPR necessitate a change in how organizations address vulnerabilities in their code. What if you could test software for unknowns? You can with fuzz testing. Fuzz testing manipulates input data to send until the malformed input causes the software to crash. Our fuzzing solution provides pre-built test suites that eases the burden of manual black box test creation. And our fuzz testing solution runs on any VM or Windows or Linux computer to produce a detailed remediation package that helps identify and fix software issues fast. Wouldn’t it be great to minimize the risks of 3rd party code? Introducing software composition analysis – or SCA -- from Synopsys. Our SCA solution quickly and accurately scans virtually any software package. It produces a bill of materials listing third-party components, their versions, and their location. And our SCA solution runs on either source code or binary, either as a managed service, or as an on premise virtual appliance, so that you always know for certain what’s in your software. As the world's 16th largest software company, Synopsys has a history of being a global leader and was recognized by Gartner as a leader in software quality and security solutions. At Synopsys, we offer the most comprehensive solution for integrating security and quality into your SDLC and supply chain and work with over 1,500 industry-leading companies across all sectors including: 17 of the top 20 commercial banks 9 of the top 10 software companies 4 of top 5 managed healthcare firms 3 of top 4 US wireless providers By injecting software quality and security at the right time, at the right depth within your development environment, our software integrity platform promotes productivity and efficiency that empowers customers to develop secure, high-quality software. Our testing solutions improve the accuracy of findings, speeds up the delivery of results, and reduces the level of noise faced by developers. How well do your security controls align with industry best practices? Software design flaws account for up to 50 percent of security vulnerabilities. If you are only checking for bugs in your code or running fuzz tests against your system you might still miss up to half of the security vulnerabilities in your software. Auditing controls, authorizations, and component updates are essential strategies to help reduce security flaws and lower your risk of a breach. But how do you know whether they are implemented correctly? Introducing Software Architecture and Design from Synopsys. Our experts evaluate the design of your key security controls against industry best practices to determine if any are misconfigured, weak, misused, or missing. Do you know how well your organization's people, processes, and technologies can withstand a real-life cyberattack? What level of access and information that an attacker might gain? Personal Identifying Information, Personal Account Number, or corporate intellectual property. What damage might a severe data breach cause? What harm such an attack might bring to the organization’s brand and reputation? Introducing Red Teaming from Synopsys. Red Teaming simulates an attack on the client’s organization to measure how well their people, process, and technologies can withstand a real-life attack situation.